I recently joined a small quilt group that just started meeting on Friday evenings again. It's really informal and we meet at someones house. I have been taking my binding to finish, a perfect project to carry around. 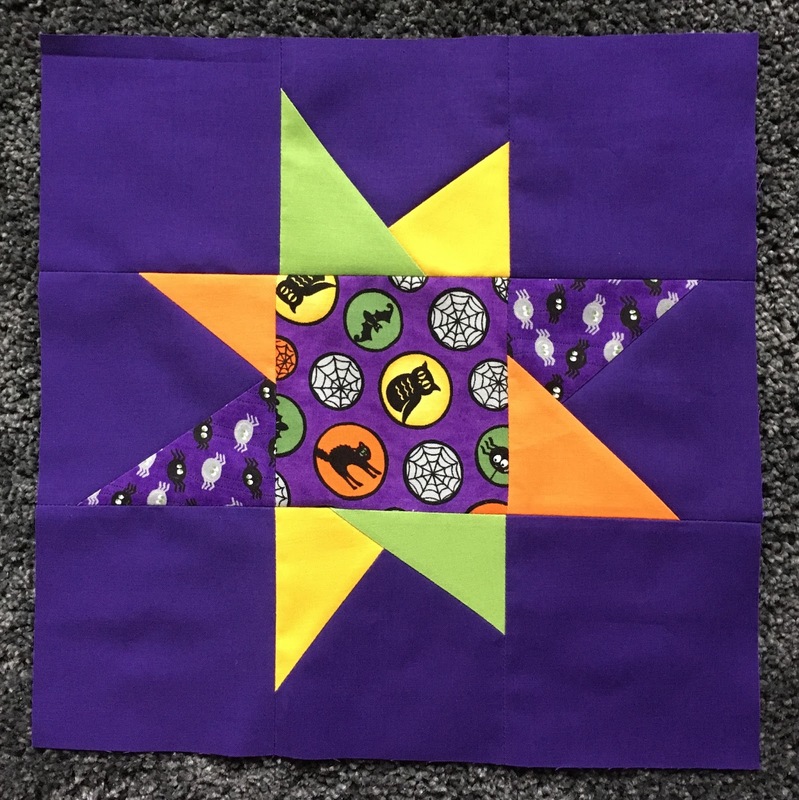 This week we started a quilt box exchange. We each create a box with a theme, colour scheme and a sample block. Each month we swap the boxes and make a block for that box according to the instructions inside. 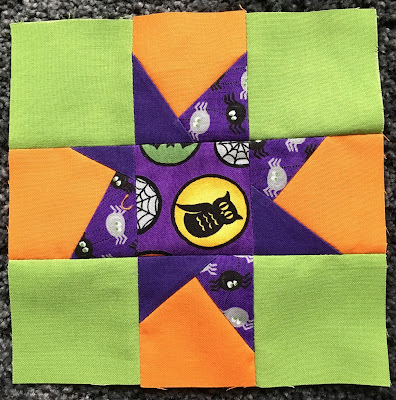 There are 10 of us taking part so towards the end of the year we should all have almost enough blocks for a quilt. There is quite a range of themes - summer, simple patchwork blocks, disappearing blocks, Christmas, shabby chic and Halloween. My theme is halloween and my colours are purple, green and orange because they were the colours in my halloween fabrics! I decided to give two options for blocks I'd like. Firstly, a wonky star block made using the tutorial here, and a choice of sizes. 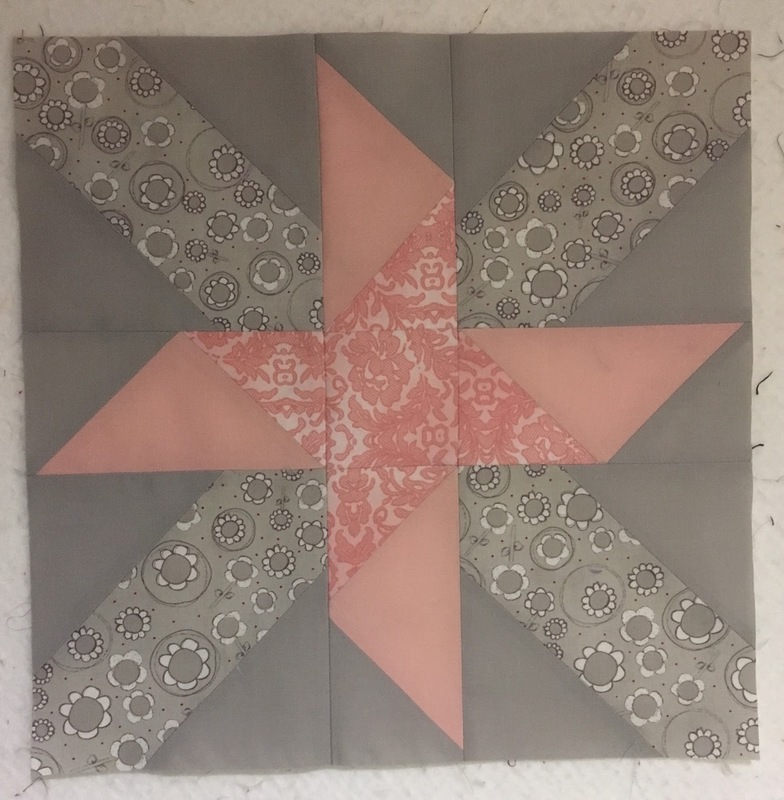 I am not thinking a rigid 4 x 3 quilt layout, so hopefully I will get a mixture of sizes, or I'll just make some myself. 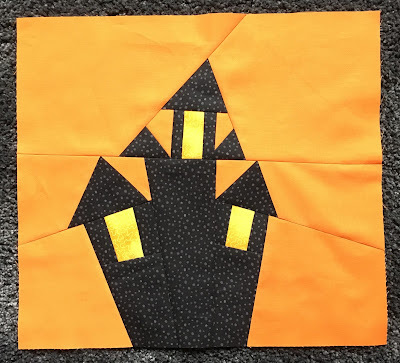 The second choice of block is a halloween style block and my example block is a haunted house made using paper piecing. The colours don't look as distinct here as they actually are. The orange and yellow look the same, but they are actually quite different. We don't get to see the blocks being made for us until the end of the swap, which is going to be really hard when the boxes are in the room. Guess that's part of the fun! Looking forward to swapping the box at the end of the month and having to make another random block. I like variety so this is great for entertainment.